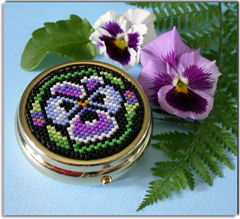 A handsome 24k gold plated pill box with a subtly shaded pansy peyote panel. A beautiful & thoughtful gift for a woman who needs to carry medication each day. Delica, size 11 bead color numbers and quantites are listed below. *ArtCraftWorld has gone out of business.